The #58 650S GT3 of customer team Garage 59 finished P6 in the second round of the Blancpain Endurance Cup at Silverstone to maintain Factory Driver Rob Bell’s Blancpain GT Series title hopes with six rounds remaining. There was further success for the 650S GT3 in Italy as customer team FFF Racing Team by ACM finished P2 in the inaugural round of the Michelin GT3 Le Mans Cup at Imola. 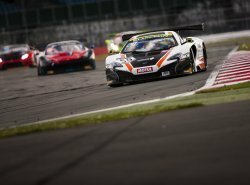 Bell and fellow Factory Drivers Côme Ledogar and Shane Van Gisbergen started the three-hour race at Silverstone P12 after an extremely tight Qualifying session earlier in the day, before fighting through the field during the race to set up a close battle to the finish. 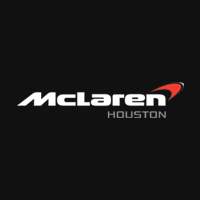 Bell started in the #58 Garage 59 McLaren 650S GT3 and in a similar fashion to his performance at Monza made up a lot of ground during the first hour of the race, handing over to Ledogar with the McLaren up to P7. After slipping back to P8 during the round of stops, Ledogar fought hard through heavy traffic, claiming back P7 before the final hour. Van Gisbergen finished the race for the customer team, and in dramatic fashion made a gutsy move to grab a further position in the frantic closing minutes after a safety car period. As the halfway point of the season approaches, Bell now sits second in the Blancpain GT Series Drivers standings for drivers competing in both the Sprint and Endurance Cups. 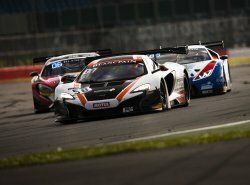 The second 650S GT3, shared by the three McLaren GT Academy Drivers Alex Fontana, Struan Moore and Andrew Watson, finished P22. Each of the young drivers – each in their debut season in the Blancpain Endurance Cup – contributed to climbing the order, overtaking 17 cars after starting P39 in a field of more than 50 GT3 cars. 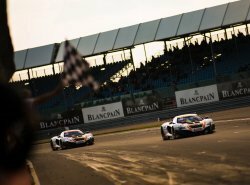 The 650S GT3 also had success in Italy, with customer team FFF Racing Team by ACM finishing on the podium with P2 in the first ever Michelin GT3 Le Mans Cup race. The brand new ACO-run series offers the competitors an invitation to race in the 2017 24 Hours of Le Mans as part of the prize for winning the championship. Japanese driver Hiroshi Hamaguchi qualified the car P4 and in the race charged through to P2 on the opening lap. Hamaguchi then spent the rest of his hour-long stint in the 120-minute race applying pressure to the race leader. At the mid-race stop, the 650S GT3 held position, and British driver Adrian Quaife-Hobbs pushed hard to close the gap to the leader. Despite reducing the gap, the young Brit was unable to challenge for the lead as time ran out, crossing the line P2 to collect silverware in his first race for the team.